We are beautiful one year old sisters who enjoy playing, going for walks and car rides. 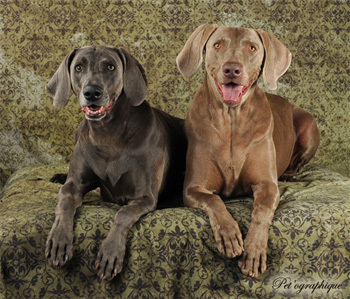 We would make a wonderful addition to an experienced Weimaraner family. Bella just turned one years old this July. she is very intelligent, active and entertaining. Bella loves playing with other male Weims. 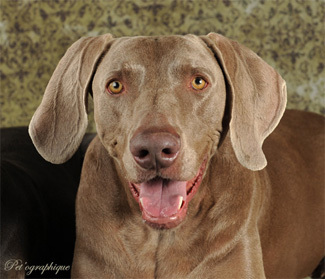 and would make an awesome companion for a family wanting a friend for their male Weimaraner. Do you like to swim and go to the Lake?? So does Chevy! He is a well mannered, handsome male who just turned 6 years old this past May18,2012. He is great with other dogs, loves to run and play with his toys, he is a well rounded loving companion who needs a wonderful "Forever Home." ASAP. My name is Zen because I am tranquil and very calm for a Weimaraner. I really enjoy making new friends the four legged and two legged types. Playing ball with me is a lot of fun. I would be the perfect addition for a active family with children and another dog looking for a wonderful companion. I am a beautiful 5 year old Weimaraner. My mother can no longer look after me and told me I need to find a new loving family. If you are looking for a well behaved, loyal companion, I am the girl for you. Is there a loving family with room in their hearts for me? I am 8 years young, sweet, loving and laid back. I am losing my family and have nowhere to go. I love children and taking rides in the car. Please contact Rescue and tell them you will adopt me! My name is Cali and I am a beautiful seven month old Weimaraner looking for a wonderful forever family.I am good with other dogs large and small. I like to go for walks, ride in the car and sleep in bed with you. I am good in the house and love to play with squeaky toys, hedge hogs, ducks etc. occasionally I may counter surf like most curious Weimaraners. Mia and Zane are a very happy couple, they love to play ball, swim, go for rides in the car and walks. They want to be part of a loving family who has the time and attention for them. Diamond is 1 1/2 year old beautiful blue female Weimaraner who would love to be part of a loving active family. She enjoys playing ball, hiking, swimming and taking walks. Do you have the time to share with this wonderful forever companion?